I have a colleague who seems to enjoy cooking nearly as much as I do. And I’ve noticed that most, if not all of the recipes that she’s raved about include bacon. I call her on this and she readily confesses: everything’s better with bacon. I’m going to find a way to help you like Brussels sprouts. And if putting a little bacon in with them does the trick, then so be it. But just when you think this is about the tastiest thing you had in a long time (say, since the Chopped Salad with Wildfire Citrus Lime Vinaigrette!) along comes half a pound of baby Bella mushrooms! Whoa! You’re going to just love this. 2 ounces isn’t a lot of bacon. Cook it low and slow and get it nicely browned. You’ll be just amazed when you finish this off with the juice of a quarter of a lemon. Trim the stem ends of the Brussels sprouts. 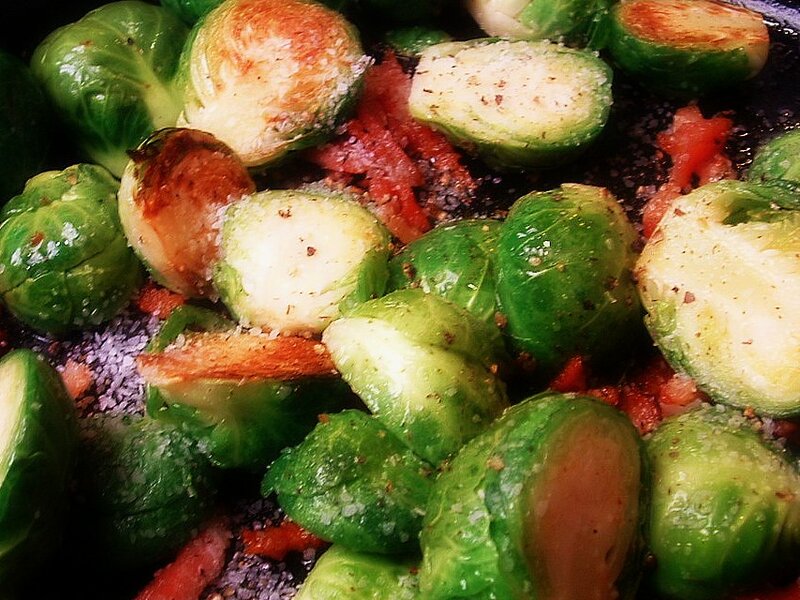 Cut the smaller sprouts into halves and cut the larger sprouts in quarters, then cut each half in half again. In both cases, cut lengthwise through the stem so that a piece of the core holds the leaves together. Cut the mushrooms in a similar manner: halve the larger mushrooms, then cut into thirds lengthwise and the smaller mushrooms in half, lengthwise. In a 10-inch straight-sided sauté pan, heat the olive oil over medium heat. Add the Brussels sprouts, mushrooms, bacon and rosemary. Season with the salt and then stir well to combine all of the ingredients. The pan will be very crowded.